Price per week £250 - £350. Outside summer holidays if the cottage is already booked the farmhouse can often be booked at a great price, even for couples - tell us the week you want! La Glycine is a carefully restored ancient farmworkers cottage at Villereal, perfect for two people, and retaining many original features. As much of the original fabric of the cottage as possible was retained during the renovation work, including a colombage wall running the length of the lounge, the wood beamed 'A' structure for the roof and several 'exposed stone' walls. The cottage is set on a small hill, so the large private terrace / garden area to the front of the property overlooks miles of rolling countryside. Villereal church and Rives church are both illuminated at night making the view even more memorable. 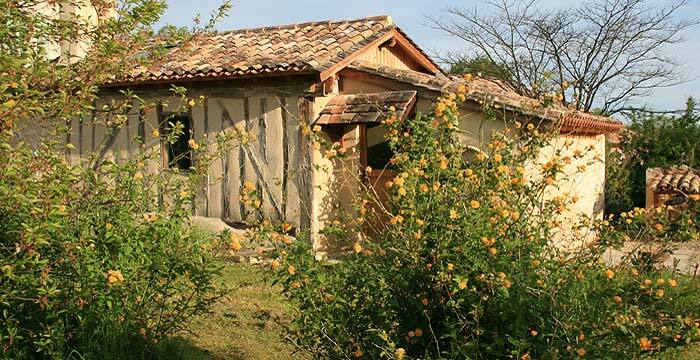 The gite accommodates two people in comfort. The accommodation is all on one level, and is approximately 55 square metres in total (i.e. larger than many 'sleeps 4' gites). The cottage is one of two holiday rental properties at Fonguilleres. We also live on site, in a renovated barn across the courtyard from the holiday-rental properties. a shower room (feature large shower). There is a TV (French only) and a DVD/CD player. The modern kitchen is found in an area that was the pig shed until a few years ago (it now includes an oven with four ring gas hob and a washing machine, but no pigs). Swimming pool: The pool is shared with the farmhouse and occasional use by the owners. The pool is large (12 metres * 6 metres) and located in a sunny spot, surroundeb by hedges and with views across the countryside. The pool is open June - September, weather permitting.The pool is both fenced and alarmed, in compliance with the safety regulations in France. If you are searching for a gite to book with friends or family - share these details with them!